With temperatures predicted to exceed 30°C on the Gold Coast of Australia the Commonwealth Games will place considerable heat strain on competing athletes. 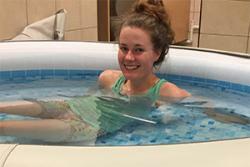 Bethan Davies, Team Wales race walker enjoying a post training session hot bathIn preparation for the heat, Team Wales athletes have been plunging into hot baths after their usual training. Rob Condliffe, a physiologist at Sport Wales Institute who is helping to prepare Team Wales athletes for the Commonwealth Games says, “The hot bath is an extremely practical evidence-based approach to heat acclimation”. Developed by Prof. Neil Walsh and colleagues at Bangor University hot baths after exercise have been shown to be an effective method to acclimatize to the heat. The original research showed that taking a hot bath after exercise in cool conditions for six days reduced resting and exercising body temperature and improved running performance in the heat. A particular strength of the hot baths is they are more practical than conventional heat acclimation strategies that require athletes to either train in an environmental chamber in the heat or travel to a hot country to train in the heat. Dr Sam Oliver, a colleague of Prof Walsh at the University’s School of Sport, Health & Exercise Sciences says, “It was the striking performance benefits in the heat and simplicity that encouraged me to share the hot bath strategy with Sport Wales in my role as Environmental Physiology advisor to the Welsh Institute of Performance Sciences (WIPS)”. “It’s a bit bizarre and unusual preparation but it’s quite fun, particularly as it’s been cold outside. WIPS serves as a hub to provide Welsh athletes, coaches and practitioners with access to the latest research in the field of sporting performance. After subsequent demonstration and trials of the hot bath strategy with Elite runners Sport Wales adopted the strategy as part of athlete preparations for the Commonwealth Games.